Does it count as "taking advice"? It's possible if they used the smaller 2500th SOverign from ERTL. How so? That one is barely 27cm long when assembled, while the one in the picture seems about the same size of the Connie-refit to its right, and if that one is the AMT/ERTL 22" model, it can't be the 1/2500 Sovereign (it would be more like 1/1250 in the best case). And the saucer shapes are too different to get them consfused, not only is the back different but the bridge modules are too: the Nova has the Defiant-ish one, which appears to be the case in the picture, while the Sovereign has a more elongated one sitting on top of a wedge-shaped layer. Andrew, the only Nova ever made is the 1400th Starcrafts version -that's FAR too small to be the ship in the display, and there was no studio model of the Nova. That means that they'd have had to specialty create a large(ish) Nova model just for the display and that seems silly. Was there ever a model on display aboard the Equinox or the Rhode Island? How about the Defiant Pathfinder, was there ever a model built of it? No models of those were ever made to my knowledge. Definitely not the Pathfinder (as there's ongoing speculation over it's ventral side). I got it! Its two sets of the six ships. Check out the deleted scenes called "Federation protocols"
...Which six ships, though? NCC-1701 from nil to E? Or NX-01 and then nil to D? And in which order? I would say E-nil, E-A, E-B, E-C, E-D and E-E.
Wouldn't/couldn't they have just used those 3-in-1 kits that have the E-nil, E-A and E-D in one and the E-B, E-C and E-E in another? But why double up? Incase Picard puts a phaser rifle through some of them again? Speaking of those kits, would you recommend just spraying them gold, or going through the trouble of painting each in its proper scheme instead? Ahhhhhh ok - That's what 1/2500 scale is. I have both boxes - but have never opened them and they are packed away in the cupboard. 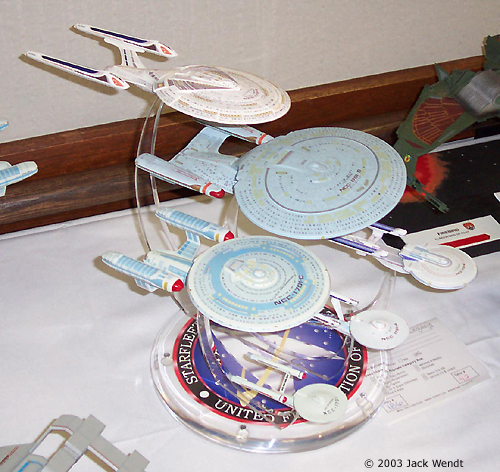 Machf, I can put you in touch with Dave Tomita (the decal master) if you really want perfect representations of the ships without (almost any) painting involved. Dave's decals even have the "aztec" patterns. Personally, I enjoy painting details but I still broke down and bought Dave's Enterprise E set. Incidentally, one of the proposed titles for Insurrection was Nemesis. Which would have made even less sense as a title. THe price for the entire set of decals (like 12 sheets, I think) is about $80. I only went for the Sovvie, myself (because the decals that come with that model are grossly too large- the registry and pennants are almost 200% too big!). Though there's a certain Zen to painting the ships that I prefer to decaling. If you already have some built/painted ships, Easy Off oven cleaner will take off any paint/decals without damaging the model.